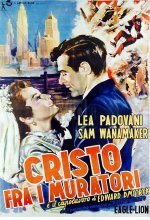 Geremio, a young Italian immigrant to New York City, works as a bricklayer and is courting an Italian girl, Annunziata, by mail. He lies to her that he owns his own home and, after they are married, has to rent one for their three-day honeymoon. The years pass and they are unable to save enough money to get out of their slum tenement, and the 1929 depression brings even harder times to the family that now includes three children. Geremio, in order to make enough money to care for his family, exploits his "comrades" in dangerous construction work. From the book "Christ in Concrete" and also known in the USA as "Salt to the Devil".